PHILADELPHIA – Steeped in the rich history of America – a nation which prides itself on vanquishing the evils of wrongdoings long passed – tourists and locals alike swarm the nation’s first capital’s Liberty Bell Center. Out-of-state visitors eagerly await the sight of the infamous crack splintering a behemoth bell; locals in line joke with their families and friends, grateful for the day off school and work in honor of the nation’s veterans. Waiting to see the famous Liberty Bell, updated scores from the nearby Eagles game bounce through the airwaves, along with some profanities and post-season projections for the team. 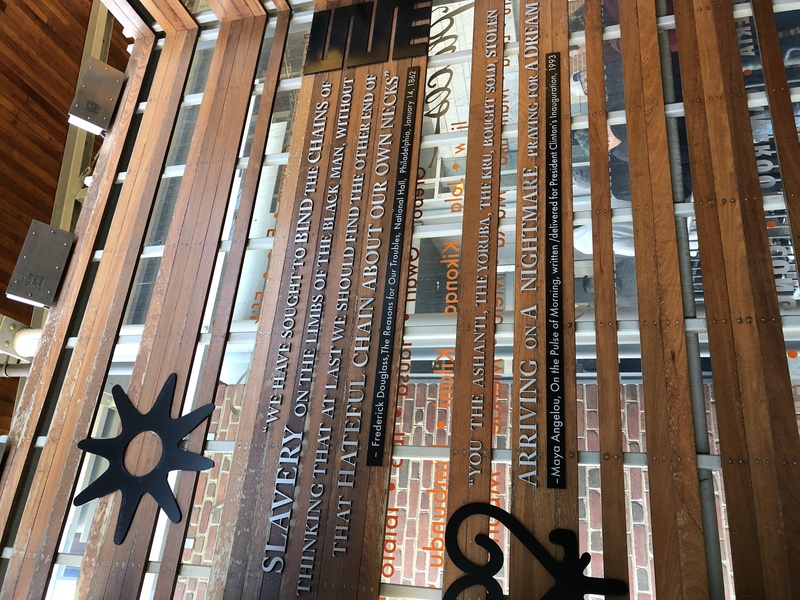 A display in the Liberty Bell Center (Photos by Lindsay Bornstein). Outside, brick-laden paths crisscross an open expanse of neatly trimmed field; the space rings supremely American, while historical brick structures in burnt auburn and deep chestnut form a surrounding wall, preventing any of the park’s national pride from seeping out. These landmarks match the autumnal foliage, whose reds and yellows blend in obediently with the structures behind them. The greens and yellows which bloomed last spring and matured in the summer have now aged into vibrant oranges and russet reds; the whole scene could perhaps be an antique postcard if not for the university students playing rounds of Frisbee on the lawn. The spacious Liberty Center lawn is ideal for recreational activities. Meanwhile, no one seems particularly concerned with the historical importance of the attraction or the disconnect between the monument’s self-congratulatory sentiment and the unfolding, broader political moment. Instead, the monument – like all other parks comprising the National Park Service – strive to maintain political independence, focusing instead on aspects such as historical importance and natural phenomena to draw visitors. As a federal agency under the executive branch – similar to the Department of Education or the Department of Transportation – the National Park Service largely remains an apolitical service available to the American people. Independence National Historical Park is not a traditional park, per se, in the sense that nature is its defining feature. 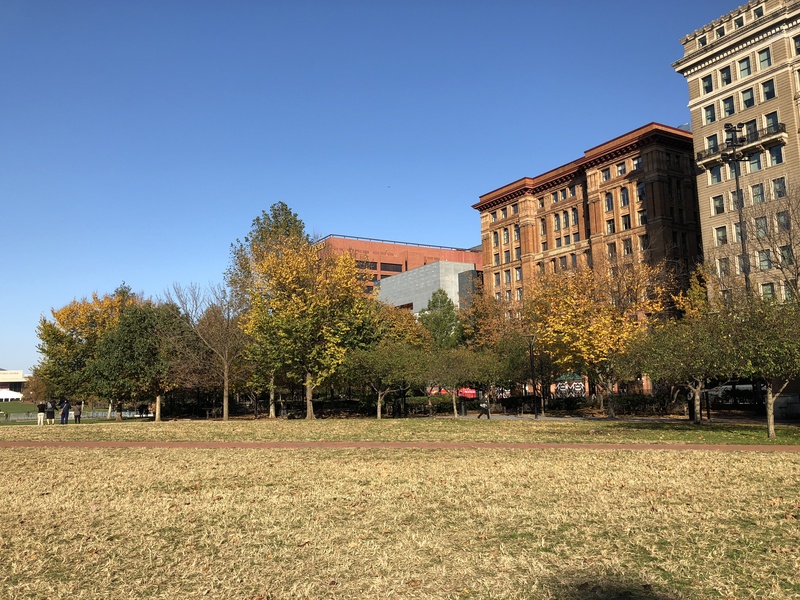 The 55-acre expanse encompasses the “greatest hits” of sorts of Philadelphia’s most famed attractions, including the Liberty Bell, Independence Hall and the National Constitution Center, among others. The park’s cultural significance, more so than its celebration of nature and natural resources, is what makes it distinct from many of the nation’s other national parks – and most other parks generally, for that matter. 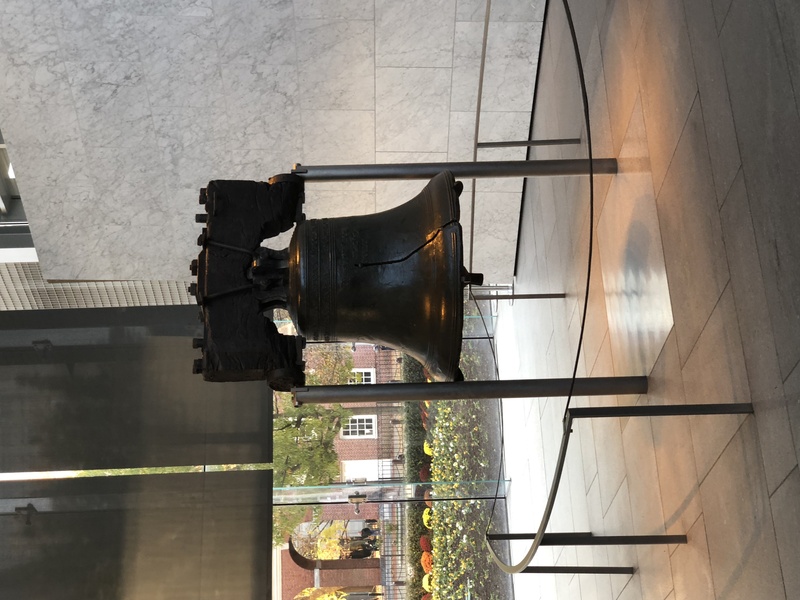 The Liberty Bell, hung still in 2018 from its original yoke, remains a symbol of America’s commitment to freedom for all. 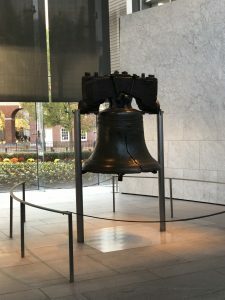 The 2,000-pound bell was initially cast in England in 1751, according to signage at the National Constitution Center; however, it was recast – meaning it was melted down and re-formed – in Pennsylvania in 1753 after suffering damage from the journey. 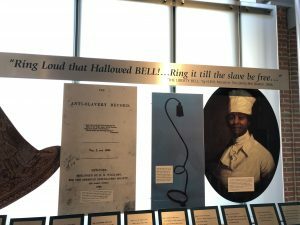 The exhibit, curated with little more imagination than a suburban shopping plaza, hosts the 2,000-pound bell in the Liberty Bell Center. Opened in the fall of 2003, the concrete and glass structure is emotionally stark, composed mainly for its utility and not, it seems, to preserve any sense of historical implication. The nation’s original Liberty Bell hangs in the Center. “The myth that it was first rung on Independence Day in 1776 is actually not true,” remarked Frank, a park ranger at Independence Hall. 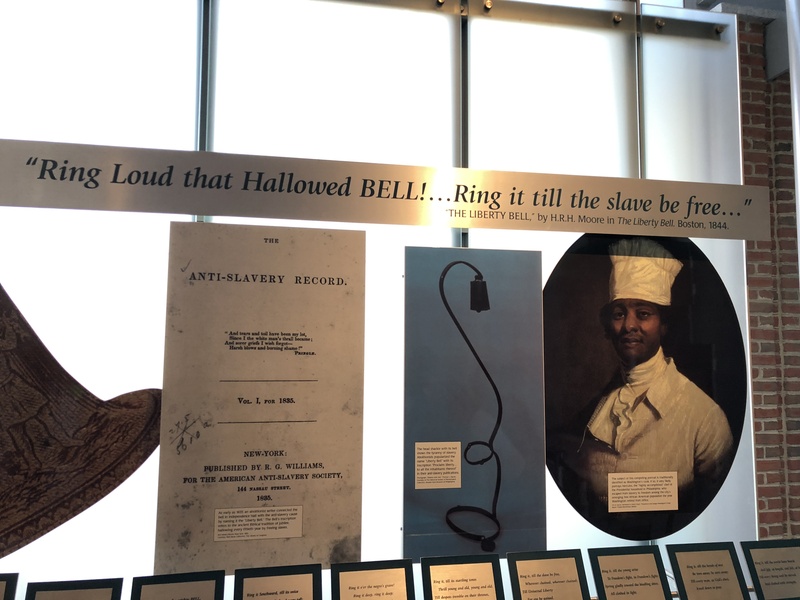 He made sure to emphasize the last part especially, perhaps to downplay the utilitarian role of the bell, which has not been rung since 1846; a birthday celebration for the late George Washington in that year allegedly caused the now-infamous crack that rendered the bell useless. The Declaration of Independence is, of course, world-renowned for its commitment to equality. “We hold these truths to be self-evident, that all men are created equal…” The sentiment is resolute, and yet, the government that resulted from such idealistic roots was one that considered African-Americans to be only three-fifths of a person; that denied women the right to elect their leaders; that encroached upon land already occupied because its occupants had a darker complexion. In line with the park’s message – one of inspiration and inclusivity, of course – Park Ranger Frank was sure to point out the progress the country made between the country’s founding in 1776 and the passing of the 13th Amendment in 1865. However, even despite the passing of the famous – and at the time, groundbreaking – amendment, African-Americans and other minorities have continued to face oppression. A caveat to the 13th Amendment allows for indentured servitude in the case of any individual who commits a crime; the loophole has been exploited overwhelmingly to incarcerate and disenfranchise black voters. A “War on Drugs” stemming from the 1980s Reagan Administration means that African-Americans are almost four times more likely to be arrested for marijuana possession and more than five times more likely to be arrested overall than whites, according to the American Civil Liberties Union and the National Association for the Advancement of Colored People, respectively – staggering statistics considering the two races commit crimes at similar rates. Disenfranchisement is, of course, not the only struggle the African-American community has faced since 1865. According to The Washington Post, 841 individuals have been fatally shot by police thus far in 2018. The vast majority have been young and black. If progress is being made, it seems as though nobody told the park’s rangers. 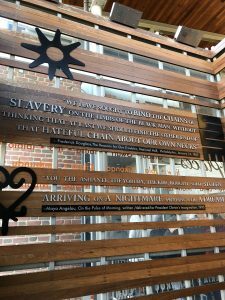 A Liberty Center exhibit focuses on slavery. There is, as she notes, no mention of today’s political leaders or discussion of the political climate within the vicinity of Independence National Historical Park. Absent is any panel deliberation about the results of the recent midterm elections. Neither the president’s name, nor his tweets, are anywhere to be heard. Instead, inspirational epithets from civic and religious leaders stand emblazoned on walls and monuments. Maya Angelou’s words encourage tolerant thought; President Barack Obama’s words ring forcefully amid a golden plaque. Perhaps a future America can blaze the trail towards freedom – perhaps a trail is already being blazed. In Florida this month, a constitutional amendment was overwhelmingly passed restoring voting rights for more than 1.2 million formerly convicted felons, enfranchising a substantial minority of the state’s black male population. In many states over the last decade, marijuana been legalized to promote the fairer prosecution of drug crimes amongst blacks and whites. A national conversation surrounding police brutality towards African Americans has grabbed cable news headlines in recent years. Park-goers are still skeptical; the younger the visitor, the more skeptical he or she seems to be. For now, Hurtado said, she accepts the smaller victories. The fact that the park publicly recognizes the African countries from which slaves were kidnapped, she notes, is a start. Despite societal setbacks, the two friends bask in the sentiment of the park, and not the reality of the current climate. Alcalá points to the bottom of the memorial plaque, reading out loud. Make sure to pack a picnic basket complete with a thermos of hot chocolate, sandwiches for all and some Cape Cod chips to complete the meal! Include a blanket in your picnic basket to spread across the lawn behind the Liberty Bell. Throw in a Frisbee to toss around the green with some friends. Don’t forget a sweatshirt or even a second blanket to keep warm!